We wanted to share some books we've been reading lately, that you might enjoy. I have to admit that given the title of the book and some brief comments I read from others before reading it, I thought this book would try to discredit the existence of ADHD and make parents feel bad if their kids were diagnosed with it, like they were all suckers. That was not the case at all. Author Alan Schwarz (a colleague from my college newspaper days and a highly respected former New York Times journalist) clearly did a ton of research, interviewing more than 1,000 people for the book, from researchers to doctors to patients. He doesn't dispute that ADHD exists and is treated by the medications on the market. My takeaway from the book is that the ADHD diagnosis is a work in progress, from what was first coined "Minimal Brain Damage" to the current ADD or ADHD name it currently uses. And that there are some doctors/researchers out there who are more interested in increasing market share for the pharmaceutical companies and lining their own pockets, than in making sure that only the affected people who really need treatment, get it. We'd like to believe that at least doctors are on the patients' sides, however in the news we've certainly seen doctors getting caught giving away too many prescriptions for pain pills, for example, causing or contributing to addictions. And even recent news of Harvard researchers getting paid by the sugar industry to turn the focus to "bad fat" instead of sugar's roles in heart disease. It's mind boggling that a highly regarded academic institution like Harvard could have researchers that crooked, but the same thing happened with ADHD research, Schwarz argues. Harvard researchers (among others) were in big pharma's pockets to promote ADHD treatment to more and more people, creating disease where it might not exist. Schwarz accepts that ADHD is a real thing, and medication treatment is helpful for some. But he argues that the diagnosis rate across the country is too high (he points to some U.S. counties where the diagnosis rate is 20-50% of kids, most of whom are taking medication). The American Psychiatric Association's guide, on the other hand, says that it affects 5% of kids, mostly boys,and this is considered by many experts to be the proper benchmark. 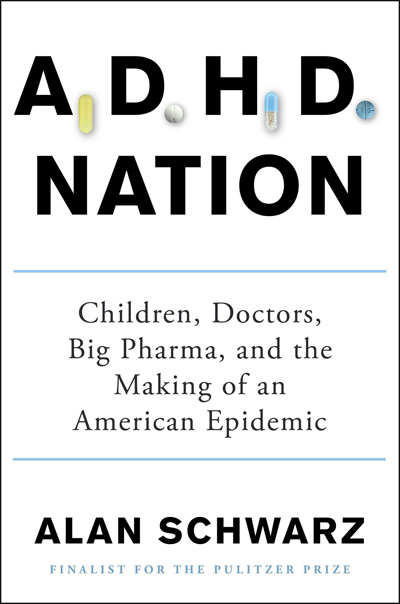 Before reading the book, I thought that if a kid took ADHD medications and they worked, that must mean they have ADHD. How naive of me! I didn't realize just how popular these medications were on the black market, especially prevalent on college campuses. I mean I'd heard of them being used by others, but I didn't realize the extent. In spite of what could be an incredibly dry book, it was a good STORY. It read like a story, and was not boring at all. I learned a lot about medical advertising through the ages, how diagnoses take shape over time, how instrument scales are developed (if you've ever looked at the ADHD scale and thought it might apply to everyone, join the club), and even how medications are named. While this type of naming convention doesn't happen anymore, one pharmaceutical executive gave Adderall its name from the idea of "ADD for All," as he planned to be very inclusive in its marketing. And Ritalin was named after the wife of CIBA chemist (who made Ritalin) - her name was...wait for it...Rita. The scientist wanted to increase his wife's energy and focus on the tennis court, help her lose weight, but not be addictive. Voila. ADHD was a fascinating read. Want to learn more? Schwarz is speaking on Tuesday night at the SFJCC at 7 p.m. So this book is quite different than ADHD Nation! I admit I hadn't read the Parent Hacks blog that this book came from. But it's such a fun and useful read that even my teen son read it and found a lot of value. This is a quick read, with each hack taking up two pages, including large illustrations. While I don't recommend that those without kids buy it, some of the hacks can be useful anyway (like covering the public bathroom flush sensor with a piece of paper/sticky note so it won't flush on you while you're doing your thing). Or using a tension rod in the shower as an extra drying rack. 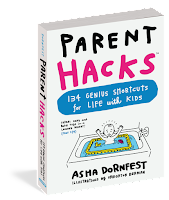 This would be a great stocking stuffer or gift for a new parent, as it gives practical solutions to real problems that parents have. I did a Q and A with the author this spring, but didn't review the book there. It's been sitting by my desk for awhile, waiting for my blog review! I sometimes wonder how some people take great risks and do well, while others fail greatly. And yet others live a life relatively risk-free. Why is that? What is it about a personality makes someone more prone to take risks or more risk averse? 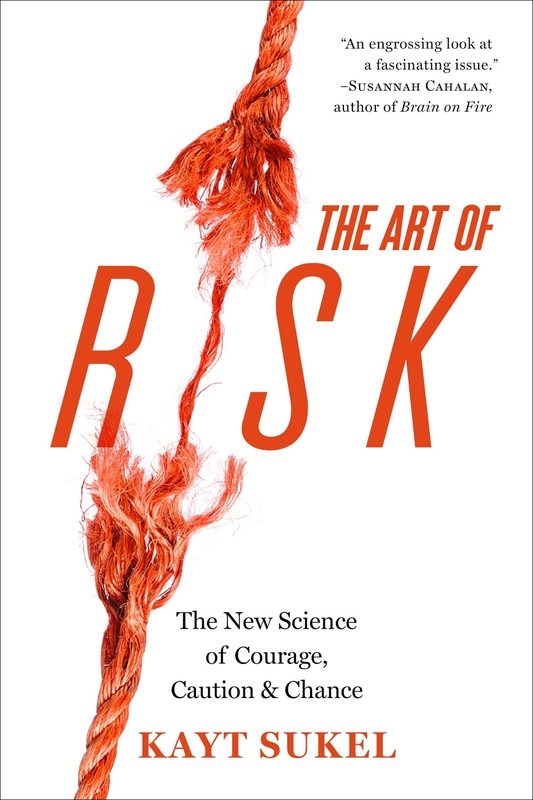 That's what this book is partly about – the science behind risk. It looks at it from a scientific perspective, but with personal examples. Risk, for example, helps you improve and learn, like when mastering a skill like rock climbing. Sukel is a proclaimed science nerd, which I am not. But she uses science along with the stories (her own and interviews) to illustrate what's happening scientifically. For example, she shows several studies about whether specific genes are related to risk-taking. But in explaining how the experiment is done, she tells of the mathematical and gambling types games that the scientists did. And Sukel herself had her genetics tested to find out if she carried these risk-taking genes. You’ll have to read the book to find out her results. One of the more interesting sections for me is the one on risk and age. Those who have (or had) teens in the house will find it especially interesting. Sukel looks at how risk-taking works in developing brains (and to be honest, the results were terrifying). It’s actually amazing anyone makes it through high school alive and with brain cells. The other section I found appealing was on risk and emotion, looking at how emotion can skew risk calculation. The book gave me another lens to look at how I make decisions in my life and what other factors are involved.